Imagine being young and in love, going for romantic drives in the countryside, passing a lonely boarded up Dutch frame saltbox sitting on the road, ,the natural landscape crowding in on the structure, weathered shakes, doors askew. Imagine looking at your husband to be and saying "When we move back here, I want that house." Imagine that he married her anyway. Fast forward a few years and imagine a vacant lot becoming available in a bucolic historic area, right next to a beautifully preserved 18th Century Quaker Meeting House. Imagine that there was a possibility of reconstructing that incredible house on this incredible piece of property. This is what took place in the late 1980's. The present owners, who are the first family other than the original builders and their ancestors to own and occupy the property in its 260+ years of existence, did just this. They oversaw a meticulous restoration. 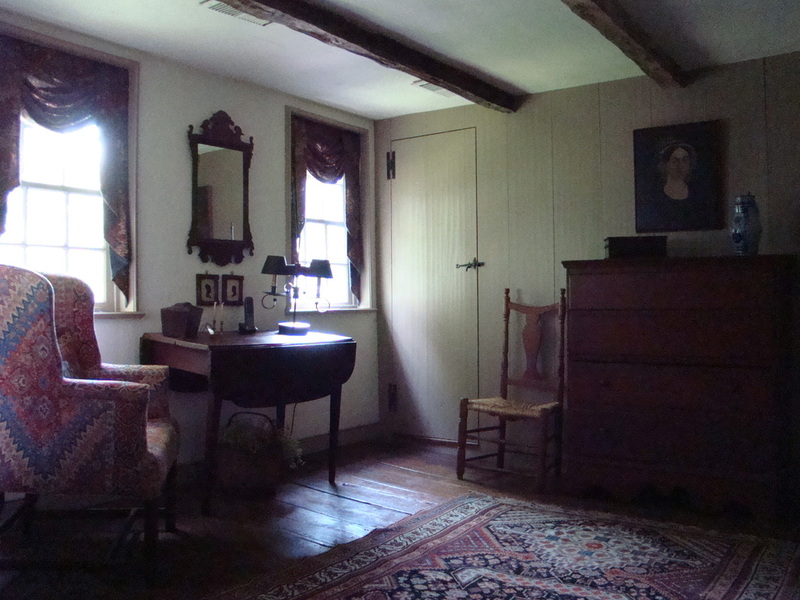 The main house is that 1747 frame house, originally built by Quakers in the Hudson Valley Dutch vernacular architectural style. All original details were carefully retained, including plain sheathed paneling in the parlor, molded paneling with original Hudson Valley spruce blue/green paint in the dining room, floor boards, hardware including the wonderful pan hinges particular to the Hudson Valley on many of the doors , butterfly hinges, and even original window glass with family initials etched in one of the panes. Two rooms have all the modern required electricity hidden as the current owners only use candles for lighting in those rooms. 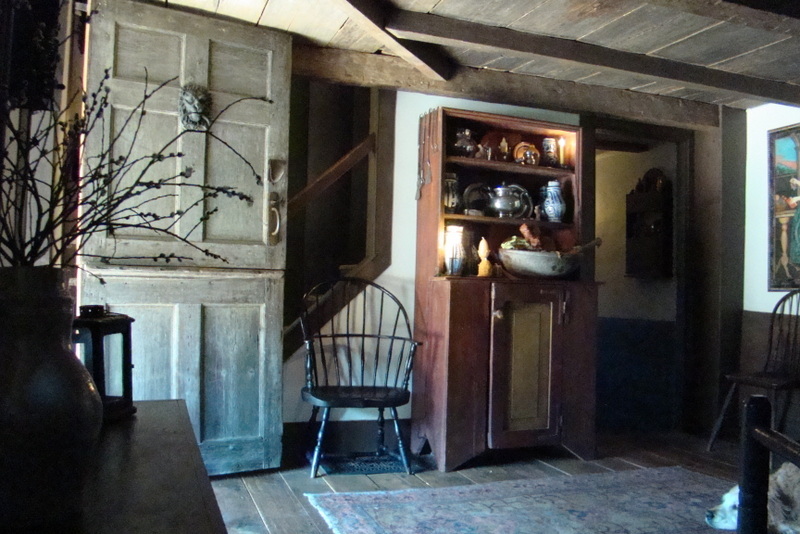 There are also pieces of family furniture and memoriabilia which remain with the house. The owners then added a second building by dismantling and reconstructing a ca. 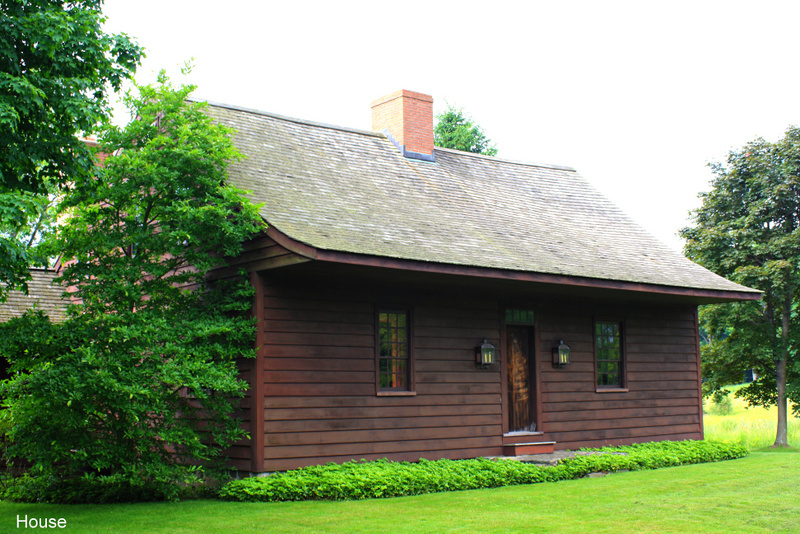 1750 Dutch gambrel house that originally was brick and stone. This is now the garage on the first level and a potting shed and guest quarters/office on the second floor, this second floor entered through the courtyard. 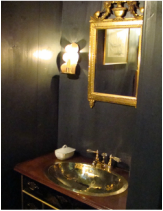 This building was originally the Skidmore House and the owners have retained many of the elements such as a fireplace surround and window trim from the Skidmore House while adding a built-in cupboard and period doors with original paint. Through the years they have also been able to collect Skidmore family documents and furniture which shall remain with the room. 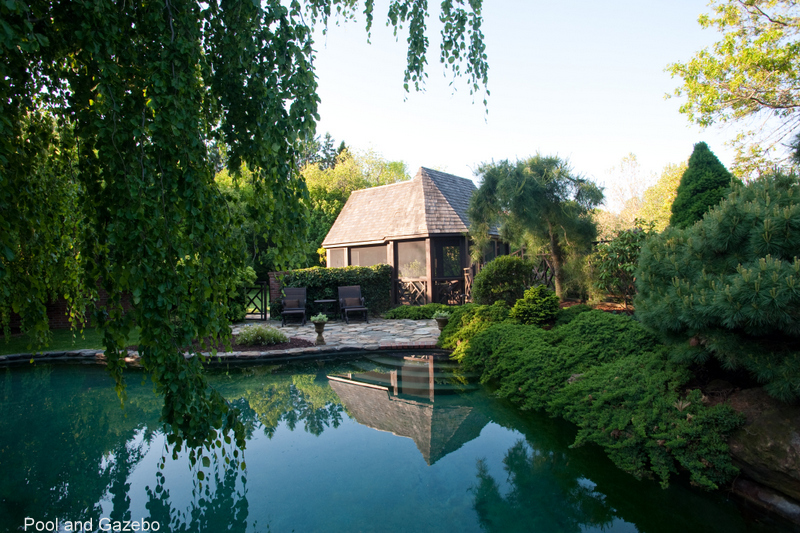 These two structures anchor the north and west sides of a magical courtyard entrance which contains three lily pools, perennial garden and shade gardens. On the east side of the courtyard completely screened by gardens is the heated, gunite, freeform pool contained within its brick and chippendale fenced enclosure. On the southeast corner is a gazebo which contains an eating area and sitting area and which looks out on the pool, courtyard, gardens and meadows. The south side of the courtyard is framed by a lily pool, gardens and view to the meadows and woods beyond. The buildings and courtyard gardens are in the midst of 5.3 acres, most of which are meadows, but there is also a small orchard with herb garden, kitchen garden, and a hidden pond area in the woods full of all sorts of unusual plants. There is also a small barn near the pond that was built of old parts in the style of the 18th Century Dutch barns of the Hudson Valley.For further details, click on "Grounds" above. And for a more detailed account of the house's history, click on "The History of the Christy House" above. Now imagine, that for the first time in its 260 year history, this property is available to anyone who is a great lover of antiques and history. If this is something you would like to pursue, please see the contact information below. We are featured in the April 4, 2014 issue of the Wall Street Journal, Mansion section. We have also been featured in the Spring 2011 Early Homes and in the Garden Conservancy Open Days. Location: The property is located just 60 miles of New York City in lower Dutchess County, easily accessible from NYC by Route 684 by car and by Metro North by train (taxi service in the village). 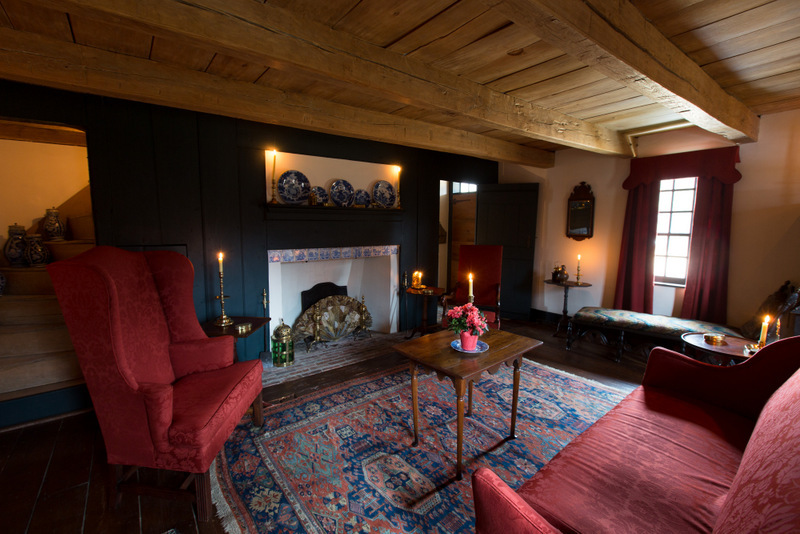 House layout: The main entrance is through a wonderful 18th Century Dutch Door with pan hinges and original paint into the keeping room with contains a large fireplace with original paint, cupboard with butterfly hinges and a stairs to the upper level of the house. Walk through the keeping room to the original room of the house, the parlor with exposed beams, sheathed fireplace wall, Dutch tiles on the fireplace, and original dogleg staircase. This room leads into the dining room which has the wonderful paneled fireplace surround with original paint, again Dutch tiles around the fireplace, wonderful original floor boards and Dutch ceiling. Adjoining is the kitchen which still retains the original mustard paint on the ceilings and incorporates the modern kitchen appliances in an unobstrusive way.There is a beautiful built-in cupboard with grain painting in the mustard colors of the original ceiling paint. From here you can either go down the hall and past the powder room or go back outside through the mudroom. 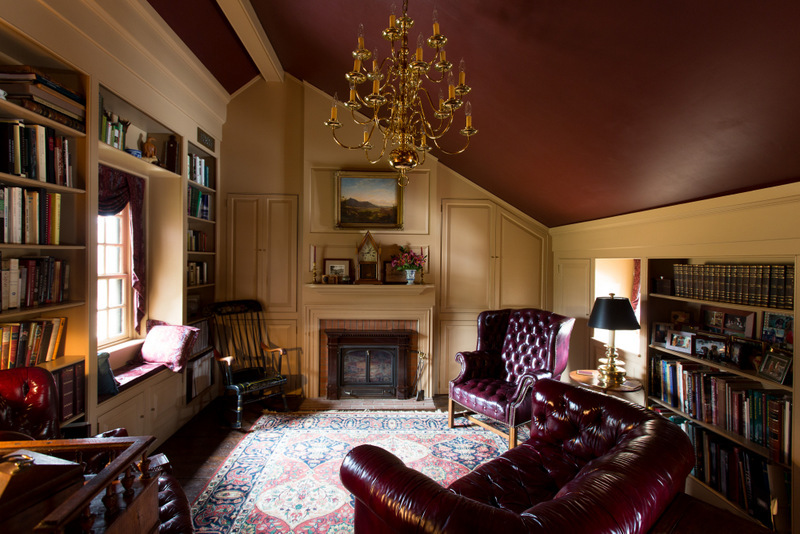 If you turn to your right as you enter the keeping room, you enter into the library, which was added to the house by the current owners and which has cathedral ceilings and fireplace. The second floor contains the master bedroom with unpainted vertical and horizontal board sheathing and an exact replication of the freeform plaster fireplace. Behind the vertical sheathing are hidden "his" and "her" "step-in" closets. The master bathroom has a hidden shower and hidden jacuzzi. 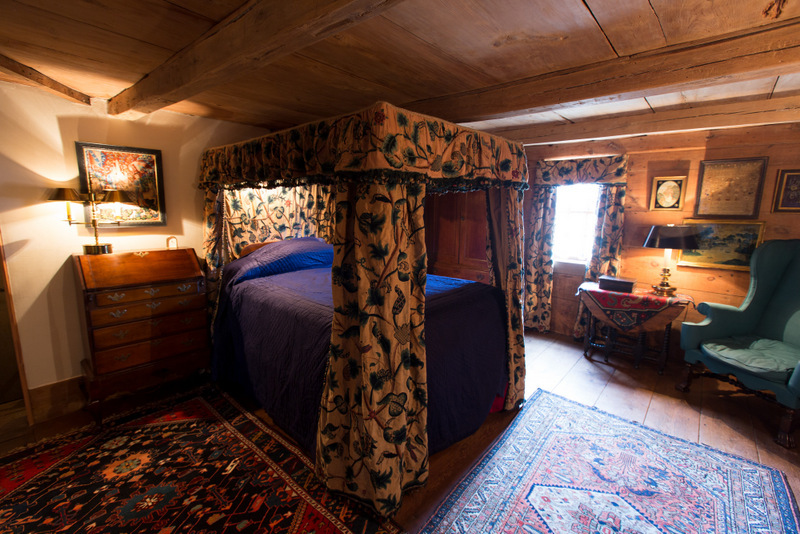 Also on this floor is the guest room with cupboard bed, another guest room with 18th Century sheathing on three walls which share a bathroom with delft-like tiled shower and bachelor chest vanity. The basement is accessed by the original back stairs being reconstructed for that purpose and contains the furnace room, laundry room with cedar closet, exercise room, storage area, and the original "animal pen" which the owners have converted into a wine cellar with an additional access to outside through a hatch door. Most of the hardware in the house is original. Replacements are either antique or area made reproductions. Most of the lighting fixtures were made in the Hudson Valley. gas generator ;New Thermopride OL16 Warm Air Furnace, Honeywell electronic air cleaner installed 12/12. Modern modern conveniences and storage in an antique house. Other: FOR THOSE WHO LIKE GOING "GREEN", remember there was not any plastic or formica back when the Hall Christy House was originally built and it was also built prior to lead paints being introduced. We have continued with this tradition. This is the ultimate recycling project, even the new buildings on the premises having been made from recycled 18th and 19th Century products. For watering, there is a cistern which catches all the rainwater from the magnificent saltbox roof with pump to areas of the garden. Also, as you walk the grounds you will notice the lichen on trees and shrubs - lichen only grows in the best quality air conditions. You can contact us for any comments, etc. at www.hallchristyhouse.com, phone number (845) 855-1809 or by filling out the form below.